Are there Benchmarks for Music Ministry? Among the many things used by the church to celebrate its faith, sacred music is exceedingly important. Sacred music forms an integral and necessary part of the liturgy. The function of sacred music in the liturgy is to serve not dominate. Sacred music heightens texts and helps the congregation express and share their faith. Sacred music that is done well helps to promote good liturgical celebrations and can nourish faith. Sacred music is meant to unite the congregation. Directors of Music are those folks who encourage and lead the congregation in their sung praise and prayer. They encourage active participation in the liturgy by means of hymnody, psalmody, responses, antiphons, and mass settings. Music directors also help members of the choirs, instrumentalists and cantors view their contribution as a genuine liturgical function of worship. Sacred music in worship is not an end itself but rather contributes to the prayerful atmosphere of the congregation. * Sacred music is valued as a gift from God and supported by the clergy and congregation. * The function of sacred music is ministerial. * All involved with the music ministry ought to have a biblical understanding of the nature of worship, sacred music, and liturgy. * The music ministry takes place within the context of the church with a shared understanding of its purpose and mission. * Members of the music ministry are servants with a clear understanding and a passionate commitment to the part they play in that mission. one another, and deal biblically and appropriately with conflict. * Standards are set by the Director of Music based on the ability of each choir. 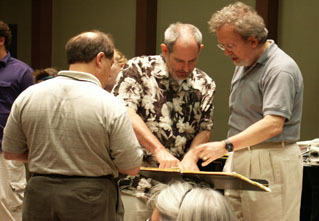 * The Director of Music participates in continuing education. * Sacred music is carefully chosen and planned. * The new hymnody repertoire is regularly and systematically reviewed. * The music ministry is technically, aesthetically, and expressively good and suitable for liturgy and effective for the congregation. * The music ministry includes a multi-choir program for children and adults. Some of Rick’s list are “mom and apple pie” kinds of things, but many are useful things to which a music ministry leader might aspire. In my next post I want to begin to set down some “practical” benchmarks for key music ministry leadership. In the meantime, I’d love to hear what you think. Should there be benchmarks in ministry? What should they be? Please leave a comment and let me know your thoughts.